WE ARE HERE TO HELP YOU THROUGH THIS TOUGH TRYING TIME. 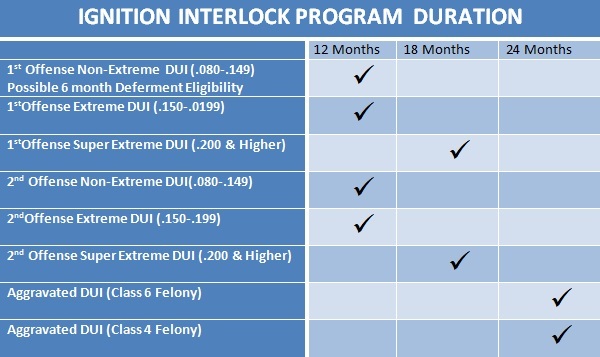 AT QUICKSTART IGNITION INTERLOCK WE UNDERSTAND HOW CONFUSING THE DUI PROCESS CAN BE. WE ARE HERE AS A RESOURCE OF KNOWLEDGE FOR OUR CLIENTS. WE KNOW THE MORE INFORMATION YOU HAVE ABOUT THE LAWS AND RULES OF THE PROGRAM THE EASIER IT WILL BE FOR YOU TO NAVIGATE THROUGH THE PROCESS. The person successfully completes an alcohol education program consisting of at least sixteen hours pursuant to section 28-1381. The person has maintained a functioning ignition interlock device on all motor vehicles the person operates and has met the requirements of the ignition interlock program for at least six consecutive months. The person has not attempted to operate a vehicle with an alcohol concentration of 0.08 or more two or more times during the period of license restriction or limitation. At the time of the offense, the person was not involved in a motor vehicle accident that resulted in physical injury or property damage. All necessary compliance information has been provided to the department by the ignition interlock device provider, the alcohol screening program and the alcohol education program. If a person is not compliant in equipping their vehicle with an ignition Interlock device the Arizona Department of Transportation will not renew vehicle registration or allow title transfer for that individual until ignition Interlock compliance is met. A SIIRDL, allows an individual to travel to and between their residence- place of employment, school, treatment facility, probation officer, healthcare professional and Ignition interlock facility. The Arizona Department of transportation NO LONGER requires an individual to complete a SIIRDL /restricted driving permit “BEFORE” they are deemed eligible for the ignition interlock system. REGARDLESS YOU MUST CHECK WITH THE MVD TO CHECK FOR ELIGIBLITY BEFORE GETTING THE INTERLOCK INSTALLED IN YOUR VEHICLE. Once the ignition interlock system is installed it is imperative to physically go into an MVD office and reinstate your driving privileges with a Restricted Ignition Interlock license. Failure to do so will only prolong the amount of time you will be required to have a interlock equipped vehicle. Avoid using the interlock device for 20 minutes after using mouthwash or use alcohol free mouthwash. Make sure you reinstate your driving privileges with the mvd immediately following the installation of the interlock device. Do not contaminate the mouth piece of the interlock device with perfumes, colognes, body sprays, hand-sanitizer etc. These substances contain alcohol. Do not leave your vehicle running while it is unattended as this is a sure way to miss a running test. Anyone who uses vehicle other than yourself should be thoroughly trained on the use of the device. Quickstart will gladly help train them. TWO Breath alcohol fails at or above a .080 will result in an Ignition Interlock Program Violation which might result in a possible extension of the interlock program. ONE Breath alcohol fail at or above a .020 will result in an ignition interlock program violation and might result in a possible extension of the interlock program. The Arizona MVD requires the interlock participant to take breath samples at random intervals after the vehicle is started. Once the device prompts the participant for a test they have 6 minutes to complete the breath sample. ONE failed or three missed running tests could result in an Ignition Interlock program violation and might result in a possible extension of the interlock program. Trying to bypass an ignition interlock device by re-wiring the connections or by attempting to administer something other than a breath sample into the device is an Ignition Interlock program violation and will result in a possible extension of the interlock program. If there is a need to disconnect your vehicles battery you must contact your QuickStart Interlock to notify them and provide receipts of repair or a receipt of new battery. Any obstruction or re-positioning of the ignition interlock camera is also considered a tampering violation and can lead to a six month extension of the interlock program. The MVD allows an ignition interlock program participant 72 hours between the removal of the ignition interlock device and the re-installation of the device. If the participant exceeds this 72 hour window the MVD requires the participant start the program over from the very beginning During this 72 hour period an ignition interlock program participant is not allowed to operate a vehicle that is not equipped with an ignition interlock device. Do not remove the interlock from the cord while the vehicle is running as this is viewed as circumvention and is a program violation.